Now that classes are back in full swing and you have gotten use to the every day routines, why not relax a bit on a Friday morning? As you enter the Divination Tower you will see the room looks like a banquet hall. Long tables are set up with Professor Morgan's desk at the very front. The tables have all kinds of vegetables, cheeses, fruits, and sodas, as well as milk and water. There is music playing, but not the calm relaxing music you are use to when it comes to entering the classroom. This time it is fun and upbeat tunes. Professor Cassie is humming to the music happily at the front of the classroom. Of course she is wearing her comfy clothes, since it is comfy clothes Friday! Welcome! Come in, have a seat, and grab a plate. Enjoy the food before class begins. Don't forget to place your proud moment in the snapcup as well. Last edited by Bazinga; 05-18-2015 at 01:09 PM. .... How in the name of Merlin was he the first to arrive? Man, he had to stop doing this! It's like he enjoyed setting himself up for awkward situations or something. Geeeez. Couldn't these class notices come with a warning? Like attention Zander Adair, the first student will arrive at approximate this hour, so you should come at this time so you arrive only a few minutes before the lesson begins. Yeah, could they make this snap cup thing a suggestion box? 'Cause Zander had a voice that needed to be heard. Someone had to stop this absurd punctuality of his. It wasn't even on purpose or anything. Merlin, couldn't a kid just walk to class without being the first one? What had become of these horrible times? This was incredibly disappointing. Despite the fact that he was the first in the room, Zander did smile as he passed by Professor Morgan on his way to finding a place to sit. "Hello, Professor... I hope you had an enjoyable holiday?" ... Oh and proud moment? I'm proud that I ONLY failed two OWLs. But I'm not proud that I showed up early to class. Why does that always happen to me? Divination. He was good at it, so he wasn't about to drop the subject yet, but he wasn't sure how it was supposed to help him with LIFE and the AFTER SCHOOL and WORKING aka ruling the world thing. Still... here he was, cause, fun! Zeke entered the tower, and very quickly wondered if he was in the WRONG tower. What the? The third year stepped in and looked about, a hand resting on his bag that swung by his side - his books where in there. Both the textbook and a random book too, seeing as he wasn't 100% sure what to bring. As for where to sit, he wasn't sure, so for the time being he stood, stared and started to make his way to the snap cup thing. "Hello Professor Cassie," he greeted, noticing that she was humming along to the music. He was in the right place, of course he was. I'm a third year now. That would do it... yep. Divination was one of Lux's favourite classes so she was excited to be here. Even though it was morning, she was wide awake due to breakfast and some tea. Of course she would have some more during class, but there was no such thing as too much tea in her opinion. I am proud that I did well on all my OWLs. Into the cup it went and now it was time to enjoy the food. Yummy!! YAY she was early. For a change. Leah walked into the Divination Tower and uh... what? The classroom looked like a dining hall. She was not even going to comment on this, as she knew what magic could do to a normal classroom. Also, if they were going to be eating, Merlin she had no problem with THAT. She walked by the front of the room where Morgan was humming to the unusually exciting music. "Hi, Professor Morgan," the Hufflepuff smiled. She followed the instructions on the board and went ahead to look for a place to sit. But not before she slipped her proudest moment into the snapcup. I survived my Fourth Year! It was a big deal, okay? When he first step onto the divination classroom, he was not suspecting this banquet dinner hall theme concept at all. Woah...is the professor getting married today and have a reception along the way? Hmm....he walked in and spotted Leah already seated at one of the tables. My proudest moment is meeting new friends I never thought I could. He smiled mainly to himself before slipping the paper into the snapcup. I am proud that I have made friends here in my new school. She was particularly happy about the one that she sat down next to. She placed the paper in the cup as the instructions had said to do and sat quietly with her hands in her lap. She wanted to talk to Henric , but he seemed to be talking to Leah and she didn't want to interrupt. So, she started taking in the scenery instead. Norah beamed at Professor Cassie as she walkednotskipped into the Divination classroom, coming to a halt in front of her and saying, "Hellloooo professor!" in her most chipper-est of chipper voices. Didja see that Professor Cassie? She was being happy JUST for you. It wasn't fair to walk into the happiest class of all the classes and not be happy, even if there were mopey things hanging around for no apparent reason. The mopes had no right to be in Divination so this fourth year wasn't gonna let 'em. So HAPPY HAPPY smiles as picked up a quill and wrote her thingy mabob for the snap cup, as usual. Divination was one of those classes Noel ENJOYED taking because it was just fun in general. He didn't had to do much and he could get by. It was indeed relaxing. Moving lightly to the upbeat music, Noel walked to the snap cup thing - where Professor Cassie was standing as well. "Hellooo Professor!" he greeted her before picking up a parchment to write. He never really wrote anything significant in but he enjoyed the act anyhow. I finally woke up on time today. Dropping it in, Noel turned and saw Leah. And look HENRIC was there too. Sliding into a seat beside her, Noel smiled at them both. "And how are my puffs doing this morning?" he asked, and grabbed a plate and then stared - WAIT. was this all just healthy stuff??? Angel walked into the classroom and smiled as she saw the Professor. "Hi Professor." Angel thought that it was cool being back at Hogwarts. "Did you have a great Summer?" Angel hoped that the Professor had, she then went over and wrote something down to put in the snap cup. Angel then went and sat down at a desk and waited for the lesson to start, she seriously couldn't wait for the first Divination Lesson. Up, up, up to the tower for Divination is where Hady was headed this morning. She was ready for this lesson and had been looking forward to it. The past two terms had passed by smoothie showing her that she actually wasn't all that bad at the subject. As she arrived this morning her eyes took in a sight that she wasn't expecting and for a moment she was confused. What exactly was going on in here? Blinking just once she continued forward and gave a small nod of her head to her fellow mates that were already seated. "Morning Professor," Hady greeted softly as she passed towards the snap cup. Pulling a quill from her bag and a piece of parchment she quickly jotted down a moment and folded the parchment setting it into the cup and replacing the quill to her bag. I'm proud that no matter how tough things can get I can usual keep a level head and don't panic. Usually. Mhmm she'd said usually. Now to find a seat...Quickly glancing around she spotted Zeke just standing there. Was the boy alright? He looked confused. Walking over to him she gave him a small nudge with her hand and lightly grabbed his wrist. "Come on, sit near me today?" She whispered gently tugging him towards the nearest table and having a seat, setting her bag down at her feet. Zhenya was usually a morning person, but she had stayed awake so late last night trying to figure out a paragraph from her ancient runes text. She just couldn't process it or understand it no matter what way she tried to look at it. So she stayed awake far too late worrying about it. She yawned a big yawn as she entered the Divination classroom, half expecting comfy chairs and tea, but almost did a double take to make sure she was in the right room. A banquet? Cool! She had worn her school shirt and cardigan, as they were super soft and comfortable, but she had worn some super comfortable pants and shoes. She wasn't sure how informal comfy they were supposed to go, but she felt like she was still in her pyjamas when she arrived. That was a good sign, surely! She felt herself wake up to the music, and was quite glad it wasn't the relaxing music that is usually on. Perhaps she would have fallen asleep, otherwise? She smiled as she entered, and said "Good morning Professor Cassie. I hope you had a lovely summer." She thought there was something different… but she wasn't sure if it was just the change of scenery. "Have you had your hair cut?" It was one of those things, Zhenya thought it looked different, but it could be her mind playing silly tricks. She placed her moment in the snap cup. I am proud I have made it to Seventh year without a detention, or losing points. She grabbed a plate, sat at her table, and pulled out the soda she had managed to obtain from the kitchen. She had no idea what it tasted like, but had chosen it at random. She wasn't familiar with her soda varieties. "Hello, Professor Cassie. Hello, Zander and Zeke." She gave them all smiles before heading over to a seat. The room was quiet, and virtually empty as he was the second student there... but that changed very quickly, and soon the voice of Lux snapped him from his thoughts. "H-heeeyy," he greeted, returning the smile. He was still standing there when Hady arrived. He watched as she wrote her proud moment thing, and was pleased when she came over and gave him a nudge. "Yes ma'am," he said, perfectly content with not deciding the seating arrangements of the lesson. He followed along without complaint and slipped into the chair beside her, shoving his bag beneath the table at his feet. "Any idea what this is about?" he asked, wondering what they were supposed to be doing. If he'd have known that they would be eating then he wouldn't have bothered before hand. Of course, come to think of it, the notice DID say something about food, didn't it? And... soda? Glad that he didn't get lost on his way to the classroom. Sometimes he needed to take time wandering around the castle and memorizing the important places like the classrooms and everything else. Arriving at the classroom, the Korean guy just blink. Uh, was he lost? Nope, but well... It seemed like he entered a banquet hall instead of a classroom. Okay, this was the classroom. He noticed the Professor was already there too. Smiling, he introduced himself to her. "Good day, Professor. I'm Jackson Hwang, fifth year transfer from Seoul." He said (still with his Korean accent) and slightly bowed. Following the other students he wrote a thing and put it on a snap cup. So far I'm proud that my English is getting fluent and.. Oh! I make some friends here. Then Jackson just randomly took a seat at the middle row. The Lioness was in a good mood when she skipped into the Divination classroom. With the sunlight pouring in and the air so fresh..ahhh, why couldn't days be like this everyday? 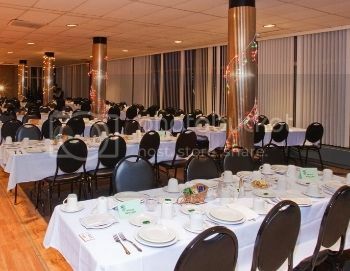 When Natalia walked in, she had noticed the banquet-like set up of the room: long tables, chairs, plates...and FOOD! Even before reading the instructions on the board, Natalia grabbed a plate and filled it up with delicious-looking treats immediately. She'd never, ever miss a free food opportunity. While holding her food-filled plate, Natalia beamed friendly at the professor. "Professor, thanks for the food!" Because teachers who offered food in class were always the best. Always. See, if you treat Natalia good, she'd treat you well back! Easy. Ma'am? Well wasn't he the polite gentleman this morning. Hady laughed quietly grinning at him. That boy just never seemed to amaze her. He was so easy going and everything was just more fun when they were side by side. "No idea, the notice just said comfy clothes, a book and your favorite soda..." She whispered in reply shrugging her shoulders as she looked from Zeke to the nicely laid out tables. Really what was this all about? It sorta looked like a dinner party or something. This was the class Rusty had been MOST excited about since she'd heard about the whole magic school thing, and she was DETERMINED to be REALLY REALLY good at it! So she practically FLOATED into the classroom, a huge excited smile on her face. She was wearing her tiger's eye charm on her bracelet - the one her grammy said helped with divining things - and clutching her textbook to her chest tightly. "Hi Professor! My name's Rusty, it's lovely to meet you!" She gave the professor a HUGE smile, then went towards the banquet tables. Look at all these lovely vegetables, this was her kind of feast. All she had to do was avoid the cheese and stuff. She nibbled on a bit of carrot and looked at the board. Hm... Proud moment. Rusty thought about it for a second, then scribbled something on a bit of parchment and dropped it in the cup. Had had never been so pumped for a Divination lesson. Ever since he had passed his OWL for this subject, he saw it in a different light. He happily shuffled into the room to come face to face with... FOOD! Eeep! Wasn't Professor Cassie just THE BEST! Speaking of her... "Hello, Professor! It's great to see you again. Did you know I passes Divination OWL?" Cassie must be SO pleased and relieved that he did her proud. "Thank you for the food, by the way. You're awesome!'' The sixth year grabbed a soda, stuck some cheese on a plate and headed to find himself a seat (after dropping off his proud moment in the snap cup). He threw Henric a smirk because he had worked up the courage to sit close to Leah, grinned at Leah, Zeke, Nats, Abby and a few other before flopping down next to Zhenya. "Heeeey, Zhenya! Cheese?'' he asked, offering the plate to his friend. I am proud of my self for passing all of my OWLs. To be honest, he quite enjoyed the class, and that was enough motivation for him to attend Professor Cassie’s lesson despite having the option to drop it for his Sixth year. Ethan expected to see the classroom in its usual state—low lights, lavender scented air, plush pillows, and what have you, but rather...he was welcomed by an upbeat music...and FOOD. Ethan pushed his way further into the classroom and greeted the blonde professor up front. “Good day, Professor Cassie! Nice...setup you’ve got here.” BEAM. Merlin...Hogwartians are indeed food driven, yeah? Ethan made a beeline for the long table and gathered healthy food on his plate. How awesome was that, yeah? There he was, working out like mad to get a good healthy physique, and the professors, particularly Professor Cassie and Maddox had incorporated healthy stuff into their lessons. Ethan was definitely winning at life. Mhmm. Getting a piece of parchment from the table, he scribbled down his proud moment: I’m proud about passing all of my OWL exams with flying colours. He got up again from his chair and placed his parchment inside the snapcup. The moment he turned, he saw someone who didn't look familiar at all...and was alone. Ethan gathered his things and plate from his former spot and sat beside the new kid. Ethan gave the guy a friendly wave and grin, and introduced himself. “I haven’t seen you around before. You must be new. I’m Ethan.” He said and pushed his plate towards the new kid. “Want some?” The food was...for free, did he know? The Korean boy just sat there and looked at the food that the Professor had served. He wasn't really hungry but maybe he's gonna grabbed some for snack? Maybe later. Then he noticed an older student took a seat beside him. Somebody from Slytherin. Well, he didn't want to judge but as his brother said that some students from Slytherin weren't that friendly. But this one seemed... okay. Hehehe. "Yeah, I'm uh... transfer student. I'm Jackson, and it's nice to meet you." He smiled and shook his hand. "Thanks, I was gonna grab some... You want some drink, maybe?" He offered. Then he stood up taking some veggies and milk for himself. Divination time! Even though Tia might not have been fond of the subject herself, she LOVED Professor Morgan's enthusiasm. Definitely made it worth it to attempt the subject. Not to mention she got to wear comfy clothes for today's lesson, which made it even more exciting to attend today. On top of the comfy clothes, there was FOOD too?!? Couldn't the professor had given them a heads up because she totally just ate, but perhaps some fruit would be alright. Scooping some onto her plate, the fifth year hummed as she made her way over towards a seat to wait - munch on her fruit, as she considered her proud moment at this time. Once something to came mind, she scribbled it down and slipped it into the snapcup. I'm proud of being in Divination today cause I get to wear comfortable clothes AND eat fruit! Divination! Penelope was really excited for this lesson. Professor Cassie was her favorite professor in the whole school, and Professor Cassie's lessons were always fun. "Professor Cassie!" Penelope was doing happy snaps. This was going to be a great lesson! Oooh, there was food! "Hi Angel!" Sitting down by her Gryffindor friend, Penelope got out a bit of parchment to write her snap cup proud moment. Now for food. Penelope grabbed a plate and went to go get some snacks. After putting food on her plate, Penelope made her way back to her seat to eat and wait for the lesson to start. I ran a pet rock adoption fair with Professor Flamsteed at the start of term feast. Kace was quite excited for this class. I mean he loved the Professor first of all and once he read he could take some food when he stepped into the classroom. Aahhh his prayers were answered. "Dont mind if I do teach.." he said and took a plate and filled it. I mean no shame there right? He had a huge appetite for good food. He was surprised he wasn't fat yet. Anywho as he got his plate quite full he needed a place to sit. He found a seat near the side and he forgot a drink. He got up yet again and got his favorite soda and sat down. There that looked good. He placed it into the SNAP cup and then began to eat his delicious food. He never realized how hungry he was. Toby didn't necessarily believe in unlucky days, nope, too negative. BUT it was pretty cool from a wizarding perspective 'cause of the magic thing, see? Yes. Anyway, that was his positive take on the date, because of course he WOULD have one. Before heading to his seat, the comfy-clothes-wearing Tobias went ahead and dropped a pre-written proud moment into the snap cup. He turned to Professor Cassie and gave her a salute in a most enthusiastic manner. "Good morning, Professor!" he said, offering her a big happy grin. "You seem happy today." He gave her some SNAPS. Snaps for you, professor. "Bludger and Curtis both say hi!" Okay, so they hadn't SAID anything. Toby was just translated. He could do that, y'know. He didn't want to crowd up the front of the room, so moseyed off to a table. Once settled, he looked at the things laid out, and instantly reached for a soda. Sooooooodaaaaaaa. I am proud of my baby brother! I don't think there's any one moment I'm most proud of, I'm just proud of him.